Scots migrating to colonial Western Australia were part of a nineteenth century trend taking Scots to various corners of the world. By the mid-nineteenth century Scots were scattered across the globe, most noticeably in Canada, the United States, Australia and New Zealand, continuing a tradition existing since the seventeenth century. But while the large groups of Scottish migrants are well known, smaller groups of Scots such as existed in Western Australia are the least recognised in settler historiography. Focussing on the lives of the first Scots arriving in the Swan River colony from 1829 to 1850, A Semblance of Scotland shows how not all Scots went out to areas with large groups of compatriots. Westralian Scots can be seen as an example of small migrant groups that, rather than be absorbed, can and do retain a strong sense of identity. Leigh S. L. Straw tutors in History at the Conservatorium of Music and at the University of New South Wales. Leigh migrated to Western Australia from Kinross, Scotland in 1988 at the age of ten. 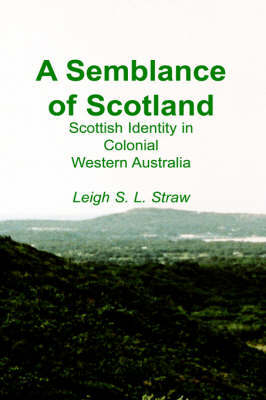 Leigh has published articles on Scottish migration to WA, presented at various conferences and is a contributor to the forthcoming Historical Encyclopedia of Western Australia. She is currently researching Scottish migration to colonial Tasmania. She lives in Sydney with her husband Tony whom she loves just as much as her White West Highland Terrier, Bonnie.